Hey everyone! I have been taking a bit of a mental health break this week (off at both jobs!) but I decided to share a quick and easy craft with you today because I just can't stay away! These are cute little office style envelopes for gift cards. There is a template available at the bottom of the post, feel free to grab it and manipulate it to any size you want in your favorite image program. While I make these to wrap up gift cards, they would also be great to make a little larger and gift recipe cards to your friends any time of year. If you have a lot of gift cards you send out at the holidays, now is a perfect time to get started on a little stash to have on hand as well. When making your template, I recommend printing it out on card stock as it is easier to trace around and will last longer than printing on regular paper. Also, the gift card envelopes I made are 2.25 inches x 3.5 inches final size. One of these days I will learn how to upload pdf files so you get things the right size to start, I swear! 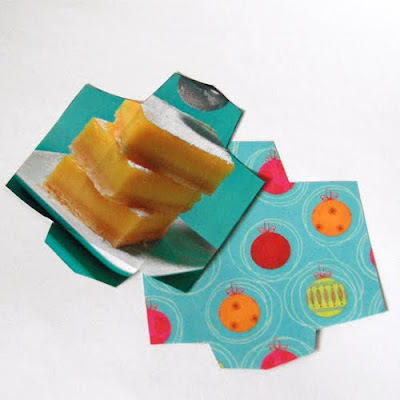 However, these envelopes are great for not only gift cards, but regular cards, thank you's and, as previously mentioned, wrapping up tasty recipe cards as well, so you will likely want to adapt it to any size you want. If you don't want to buy paper, I would recommend using magazines or store catalogs. These often have at least some pages that are thicker, but if you like the images on the very thin magazine paper, I suggest using a piece of tape on the backside or your envelope where you will be sewing your button into place to help avoid tearing your paper (you could also glue multiple sheets together but that makes this project much more complicated than it needs to be). The magazine paper is an extra cute idea if you make your envelope go with your gift card: card to Pottery Barn? Make it out of one of their ads or a page from their catalog, etc. Once you have your paper cut out in the size you want, I generally use my Xacto knife to score my folds (very gently, I really don't even push, just drag the blade gently across the paper). I score the "pretty side" of my paper, not the back. A ruler helps to keep your lines straight, if you don't trust yourself scoring the paper, you can also line up your ruler and fold against it to keep your folds crisp. Then, I select my buttons (I generally use matching buttons on each envelope, but it is not necessary) and my embroidery floss. Sew your button into place as marked on the pattern. If you have small grommets, you can use card stock circles and grommet them into place, but again, not necessary. I try to buy special equipment as rarely as possible. 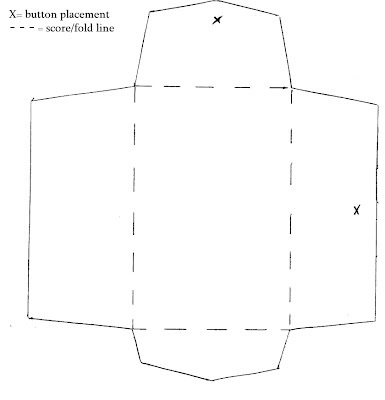 When sewing your button onto the top flap you will want to sew it securely, tie it off and then rather than clip your remaining thread, sew back through to the outside of your envelope and tie a knot around the base of your button, then leave the remaining string so you can fasten your envelope shut. Once you have your buttons attached, you will need to glue your two side flaps together. To do this, I use a small paint brush to apply a very thin layer of glue onto the back side of the shorter flap (the one with the button sewn onto it). I then fold the envelope closed, long flap down, shorter flap on top to secure them. Be sure not to use too much glue as you don't want it seeping out and sticking your envelope closed to the point it is unusable. Then, with a small amount of glue, close the bottom flap over the two side flaps. You will use the buttons and string to close your final envelope (yes, it is reusable!). I always make several at a time and save them in a little box so I don't smash them. love itttt! Totally making some this weekend! Thanks :) Let me know how they turn out! Cute idea! Reminds me of the envelopes I used to make to send letters to my cousin in the mail. You know, before facebook/twitter/email. We would make envelopes out of magazine pages! Thanks for the template! I will certainly put it to good use. Great idea! Wow! These are so adorable! and awesome! How cute would it be to make these and package my orders in them!!! Thanks so much for sharing! Terribly cute! Thanks so much! I am going to keep it in mind and will use it custom gift card when i needed. Like the idea and the Gift Card envelopes..thanks you share it with us.